About Our Zero Carbon Build | What's NEW at EcogenBuild? Construction has finally begun on our new home. It will give us the zero carbon lifestyle that we’ve been working towards for years. We are pulling together everything we’ve learned to get as close as we can to our goal. Built-in features will not only zero our home’s carbon footprint; they will produce energy for transportation and assist with production and storage of food. This home will not only allow us to live carbon-free, it also increases our resilience in a time of uncertain energy costs and availability. We’re strong believers in a three step approach to carbon emissions reduction that starts with Conservation, is followed by Efficiency, and is then completed by Renewable Energy Generation. Conservation is a simple concept, but because it is behavioural in nature it can be difficult to enact. We’ve been working on our routines to reduce consumption and to be more efficient with the limited resources that our environment provides us. Conservation is also designed into our house; that is, the house is designed in such a manner as to make it easier for us to conserve resources. Careful layout of rooms helps provide natural day-lighting, and plumbing systems will reduce energy and water wastage. Designed-in, amply-sized recycling centers will make it easier to divert waste from the landfill. Common and multipurpose rooms will reduce building size and cost. Electrical kill switches will de-energize circuits with phantom loads from appliances, lamps and electronic devices. Passive design, starting first with very high levels of insulation and air-tightness, and then incorporating passive solar principles. The Passive House approach provides an excellent framework to achieve this. Maximization of Natural Energy Generation is simpler and less costly with renewables when the building is made as efficient as possible. Sources of energy we’re tapping into for this house include the sun for both heat (solar thermal) and electricity (photovoltaic / solar PV). We’re also tapping into the earth for both heating and cooling energy. Both sun and earth sources feed automated systems, but windows, doors and thermal mass also allow us to manually use cool night air to passively flush heat from the house. Electrical energy can be generated to offset consumption with a grid-tied PV system. Batteries can be incorporated in a grid-interactive system (think of it as an off-grid system that uses the grid as a back-up). We’ve chosen both: a grid-tied system will generate more than is needed for the house and our electric vehicle (2012 Nissan Leaf), and a grid-interactive system will power critical systems like well pump, solar thermal system, heating and DHW (domestic hot water), ERV, fridge, freezer, some lights and some small plug loads like cell chargers. This provides deep resilience by allowing us to indefinitely have critical house functions without grid power. Thermal energy is available from the earth and from the sun. A large solar thermal collector array will provide heat for both DHW and radiant floors. The big feature of our home is its large thermal energy storage vessels. They’re integrated into the building; one for inter-seasonal storage and the other for high temperature DHW heating. Between them, enough energy will be carried forward from the summer and fall to augment the collectors so that the house can make it through the winter without the need to use any external energy sources – particularly carbon! The system is even large enough to provide extra thermal energy to heat a small greenhouse in the spring and fall, to lengthen its growing season. If we weren’t into growing our own food, the excess thermal energy could be used to heat a swimming pool (which is not in the plans). The house is heated by radiant floors with a concrete over pour. It is true that in most cases it is hard to justify the additional cost of radiant floor heating in a house built to the Passive House standard, and that the floors don’t necessarily provide that “warm to the touch” sensation. However, heating this way enables us to maximize the efficiency of our thermal storage system and to use ground source energy at sensible temperatures to cool our house through the floors (i.e. with just a pump, not an energy-gobbling heat pump). The earth is also tapped for heating and cooling energy for the ERV and the integral root cellar. In the summer, ground-cooled water will pass through a heat exchanger to strip heat from incoming air and to partially dehumidify it. 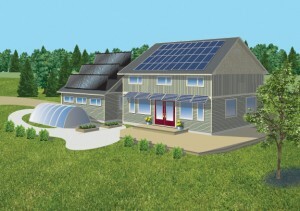 In the winter, an earth loop system will preheat incoming fresh air. The root cellar temperature will be moderated (cooled or heated, depending on the season) by the earth, and it will be ventilated naturally. A highly efficient building with high performance windows and appropriate shading provides incredible comfort. Passive House delivers this. Windows and frames with an overall insulation value of R10 provide comfort even on winter nights when normal windows are too cold to sit beside. Windows are also tuned for either solar heat gain or rejection, depending on their location. Carefully designed shading keeps the sun out during the summer, but allows it in during the winter when the heat is wanted. The level of airtightness in a Passive House demands efficient and balanced ventilation to ensure occupant health and a pleasant environment. Consequently, it is very worthwhile to install an extremely efficient and effective ERV and distribution system to act as the “lungs” of the house. Good design and careful installation ensure that fresh air gets to all corners of the house and that stale air gets exhausted effectively. Healthy indoor air quality also implies careful selection of materials. Cabinet materials, paints and floor coverings can all introduce VOCs, toxins and other harmful contaminants into this airtight envelope. We’re paying attention to all of these aspects. This project is a culmination of years of research and implementation. Through our business – EcoGen Energy – we’ve worked with and innovated many of the active energy technologies and heating systems described. We are now branching out into building Passive House buildings. It has been a deliberate and careful evolution, culminating in this project. We’re particularly excited with how it brings together the things we care so much about: the environment, healthy home-grown food, emissions-free transportation, and of course a place to enjoy and share with family and friends. If this journey is of interest to you, please follow us on our blog. To get your name added to our notification list for new posts, write to us at info@ecogenenergy.ca or subscribe directly on the home page. We do intend to hold Open Houses at various stages during the construction and following completion. Write to us if you are interested in attending one. If you are part of a group and would like a presentation, contacts us. We are excited about our innovation and pleased to show it, and to help others to move toward a zero carbon lifestyle!